that makes it easy to stay on top of your deals. Systemize Your Real Estate Deal Flow. Try Reiance for Free. With Reiance, you will be able to organize information on real estate deals and contacts. You will focus more on investment decisions, not looking for your note. Register for free. Effective organization of deal information is essential to a successful real estate business. 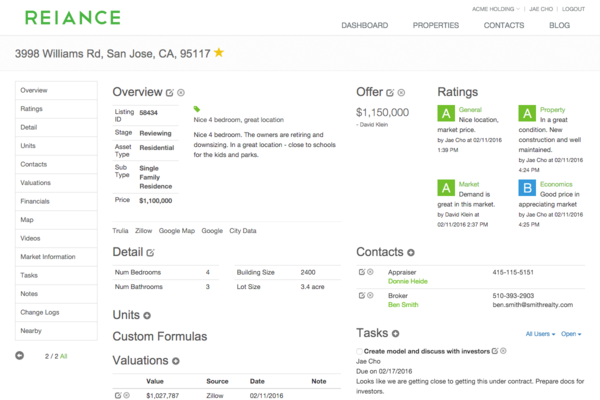 Using Reiance, you can manage various property information in a single location, including pricing, ratings, notes, contacts, links, history, and more. Invite your team members for easy collaboration on real estate deals. Share information and ideas on a property in one platform. Real estate business is about people as much as about properties. Reiance is a framework for managing contacts related to real estate properties. Reiance is effectively your own private real estate database. Storing information on properties and contacts to increase market intelligence. Reiance working out very well and we love it. Get Organized. Try Reiance for Free. Don't just take our word for it. Register for free and speed up your real estate business!